Pears transparent soap is a brand of soap first produced and sold in 1789 by Andrew Pears at a factory just off Oxford Street in London, England. It was the world's first mass-market transparent (actually translucent) soap. Under the stewardship of Thomas J. Barratt, A. & F. Pears initiated a number of innovations in sales and marketing. 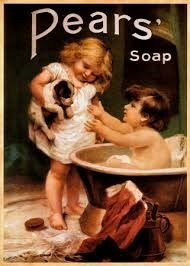 According to Unilever records, Pears Soap was the world's first registered brand and is therefore the world's oldest continuously existing brand.